At Conserve, when we discuss about green buildings it refers to high performance sustainable built-environment. We believe that, the triple bottom-line of people, planet and profit is well addressed and taken care of when we choose to embark on the journey of developing sustainable built-environment a.k.a. 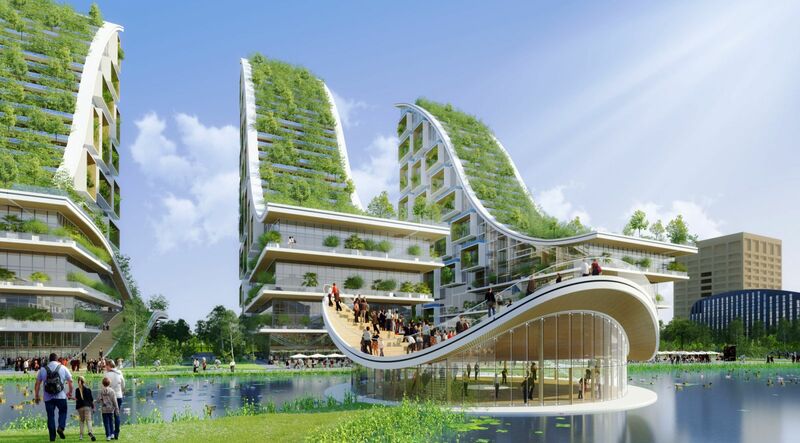 green buildings. Right from the beginning, Green Buildings incorporate crucial measures to improve the performance of buildings with less dependence on natural resources and without compromising upon the health and productivity of occupants. To grasp and understand the significance of Green Buildings, let us now discuss on the Tangible and Intangible aspects in a simpler way. When we talk about the tangibles, it usually refers to the cost involved by virtue of capex and opex. It is a myth that green buildings are costlier when compared to conventional buildings. But, if we analyze the cost during the overall span of a Project Life Cycle and Building Life Cycle, we can see the financial benefits in a more conspicuous way. Through passive architectural design and green technologies, the development cost of the buildings can be reduced to a greater extent by leveraging upon natural ventilation and day-lighting. Also, energy modeling and simulation study during the design phase of a green building project lead to the implementation of the most efficient active design alternative. Many a times, the energy costs during operations stage of a building are assessed standalone without considering other factors of water, waste, indoor air environment etc. Green and Sustainable Buildings employ an integrated approach while analyzing the business case of a particular project. All the factors are given due importance by considering the interdependence of various building aspects related to energy, water, waste, air quality etc. Sustainable Green Buildings improve the overall performance and efficiency by optimizing the use of natural resources and thereby minimizing the total utilities cost. Discussing the intangible benefits of green building, the occupant’s health and comfort are the major concern of the Sustainability firms like Conserve Consultants. We always ensure that the health and comfort of end users (occupants/residents) are never ever compromised upon, while we engage with tangibles viz. usage of natural resources and cost. At Conserve, we strongly believe that Sustainability and Profitability go hand in hand when it comes to green buildings. It has been proven true in many of our luxury projects, where the term ‘luxury with a responsibility’ aptly fits. So while we ensure the health and comfort, the productivity is automatically taken care of. In a recent study by Harvard University on Public Health, Cognitive functions are found to be higher in case of green buildings. In terms of intangibles, occupant’s productivity is the strongest impact of green buildings which is beyond all measure. Hence we can say that, whether it is a living space, workplace, educational institutions or any other built-form, HIGH PERFORMANCE SUSTAINABLE Green Buildings demonstrate a strong business case. Ravi Shankar ,Conserve Consultants Pvt. Ltd.
Our Team consists of LEED FELLOW, LEED AP, IGBC AP, GRIHA Trainers&Evaluators, Architects, BEE Energy Managers, ECBC Master Trainer , ISO Certified professionals etc.